Veteran Bollywood producer and director KC Bokadia, who has made blockbusters with the likes of Amitabh Bachchan, Salman, Akshay and Rajinikanth makes his foray into Tamil cinema with a movie Rocky –The Revenge which revolves predominately around a dog . It is based on his 1985 Hindi film Teri Meherbaniyan. The movie begins with few animal smugglers entering a bungalow and steals two puppies of German shepherd breed. While on the way, the door of the van opens and one of the puppies falls down. ACP Santhosh (Srikanth) who rescues the pup takes it to his house. He and his wife (Eshanya Maheshwari) name it Rocky and send it to police dog training school. A few years later, the fully trained Rocky returns home. Meanwhile, Santhosh is at loggerheads with the local MLA Thenappan (Sayaji Shinde). Santhosh arrests Pandi (OAK Sundar), the henchman of Thenappan on weapon smuggling case and puts him behind the bar. An irked MLA waits for a chance to kill Santhosh and bumps him off; the eyewitness to the murder is Rocky. The rest is all about how Rocky avenges the death of his master. 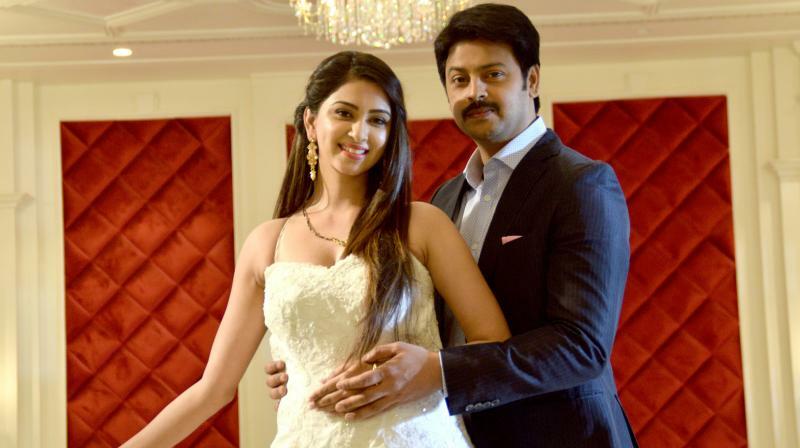 Srikanth in a brief appearance replete with two romantic numbers with Eshanya is just adequate. All others Nasser, Sayaji Shinde, OAK Sundar and Brahmanandham don’t have much as the story is centered on the dogs. Rocky even has an intro song bit and flashback portions. The well-trained two German Shepherds look majestic and given an outstanding performance. But the problem with the film is its 80s style of narration and dated dialogues. Music by Bappi Lahiri and Charan Arjun is okay. Had the director concentrated on a tauter screenplay keeping the present scenario in mind, the film would have been more palatable.